For more than twenty years, Amber House has provided discerning guests with the perfect blend of elegance, comfort, and hospitality. Ideally located in the heart of vibrant Midtown, our two historic homes, a sophisticated 1895 Colonial Revival and a stylish 1905 Craftsman are within walking distance of finest restaurants, shops, galleries, and entertainment. All marble-tiled baths, some with Jacuzzi bathtubs for two or antique claw-foot tubs. Plush bathrobes, TV/DVD, Ipod docking station and high speed Internet access. A delicious gourmet breakfast is served in your room, dining room or the garden at the time of your choice. Free Parking. We are a distinguished AAA 4 Diamond Inn. Check our website for seasonal specials and to make your reservations online. Room/Reservation Cancellation Policy: Must cancel before 5 days of reservation, full price of room will be charged unless resold. Cost of Self Parking: Free. Announcements: Amber House is perfect for all ages, you will not want to stay at the large chains once you stay at Amber House, we are close to all shopping and restaurants and have a warm friendly staff with free/easy parking you will not get at the large chain hotels. 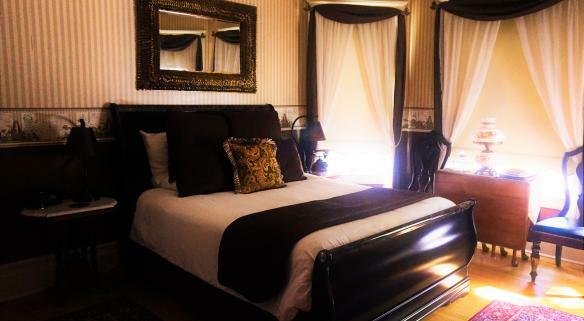 Come see our beautifully appointed rooms with first class linens for that comfortable night sleep. Not to mention we are only 1 easy mile from convention center, either a 5 min car ride or a beautiful 15 minute walk.